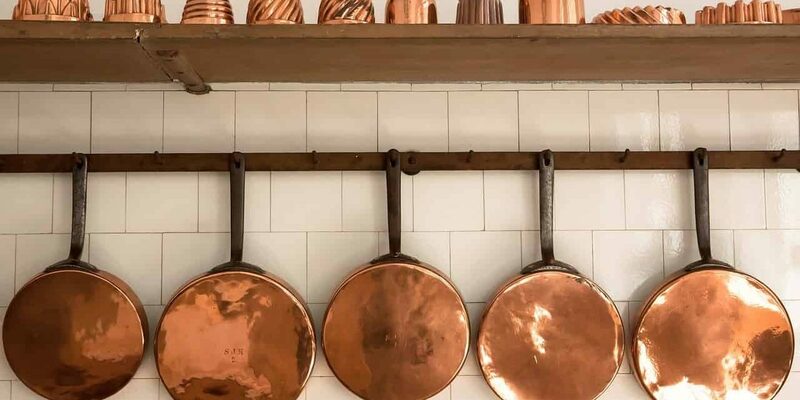 Copper pans are not only attractive accents to your kitchen, but they’re great heat conductors. Copper pans offer a nice and even distribution of heat for easy, consistent cooking. There are some great copper sets out there, and we’ve picked the best three. Read on for the three best copper pans to buy for a new touch to your kitchen. Copper exterior and aluminum inner core combine for superior conductivity and precise cooking control. Non-reactive stainless steel interior offers the reflective cooking surface many chefs prefer. It's brushed to maintain its like new appearance through years of daily use. Precision fit stainless steel covers seal in heat and moisture. Flared rims are more durable; make pouring neat and easy. This is an incredibly attractive and versatile set from Calphalon. You get an 8-inch omelet pan, a 10-inch omelet pan, a 3-quart saute pan with lid, a 6-quart pot with lid, a 1.5-quart saucepan and a 2.5-quart saucepan, both with lids. This is basically everything you need for most everyday cooking activities. The materials are really impressive and explain the higher price tag. The core is made from heavy-gauge aluminum, the exterior is made from copper and the interior cooking surface is made from stainless steel. All three of these materials are super durable and won’t scratch or become damaged even with hard metal utensils and cleaning tools. Another cool thing about the tri-ply construction is that both copper and aluminum are fantastic conductors of heat. They grab the heat, hold it in, and disperse it evenly throughout the cookware. This ensures a really hot cooking surface for searing and bringing liquids to a simmer quickly. Even heat conduction is great for avoiding hot spots and an uneven result. The handles have been carefully thought out. They are secured to the body of the pan or pot with double riveting which ensures durability (they’re never coming off). They’ve also been designed for comfortable, sturdy grip and they even remain cool during the cooking process. They’re made of stainless steel so they look pretty classy too. 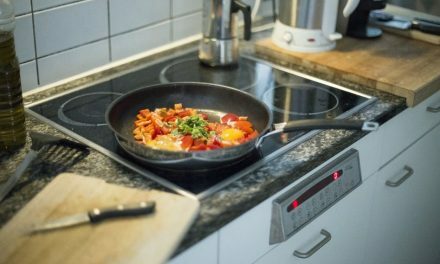 Some pots and pans can be a little iffy when cooking acidic foods such as tomatoes. They can cause a reaction with the cookware material, resulting in tarnishing and even chemical seepage. This copper cookware set doesn’t have this issue, you can cook as many tomato dishes as you want and it won’t react or tarnish. You can use this set on any cooktop, including induction, and yes, they’re oven safe! That’s always a fantastic bonus for any cookware set, as it just opens your cooking options wide open. If you need a copper cookware set which you can throw into the dishwasher you’ll have to keep looking, as this one is not dishwasher compatible. 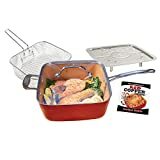 This is a fantastic choice for anyone in need of a high-quality cookware set to cover all the bases. Perfect for anyone who likes to add flair and style to their kitchen as well as versatile cooking options with well-chosen, durable materials. Here we have an incredibly versatile and durable pan with a multitude of uses. It’s a large, deep-sided, square pan with a glass lid. Doesn’t sound so exciting, but it really is. It has a tough aluminum base coated with a thick layer of ceramic which has been infused with copper. This combination of materials ensures an even heat distribution for smooth cooking. You also get a couple of cool accessories with the pan and lid: a frying basket and a steamer/roasting tray. Health and safety gets a tick, as this pot does not contain any PFOA or PTFE, so you can cook freely knowing you’re not cooking chemicals into your food. What’s great about the ceramic coating is that it’s non-stick. 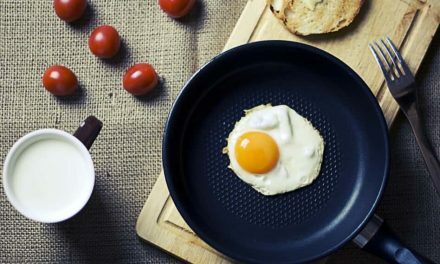 Non-stick surfaces are not only great for easy, mess-free cooking but they’re great for the clean-up job too. 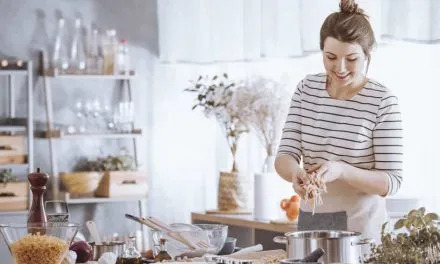 You can far more easily clean even the stickiest messes from non-stick cookware than you can from more traditional all-metal cookware. The reason we had to include this in our list is that it’s extremely versatile. It’s suitable for oven use, up to 500 degrees Fahrenheit, which means you can double it as a roasting dish as well as a stove-top pan. The only drawback in the versatility department is that it’s not compatible with induction cooktops. We really love the deep sides of this pot, as it means you can cook large or small quantities in the same pot. You can roast a chicken, whip up a stir-fry or pasta, simmer a sauce or slowly cook a risotto. You also get a couple of handy extras such as a frying basket if you’re into deep frying, and a steaming/ roasting rack. The roasting rack allows you to cook two different layers of food at one time. The question of whether or not a dishwasher is a safe option has two answers: yes, it’s technically safe for the dishwasher. The second answer: it’s best to just stick to hand washing to avoid any damage or wear and tear. We see this as a great pot for students or new cooks with a smaller kitchen and a need for versatile, safe and sturdy cookware. The last on our list is the very shiny, very stylish, and very high-quality saucepan from Demmex. We’ve chosen this particular saucepan for people who might not need a whole set, but are in need of a new saucepan to add to their cookware set. This pan has been handcrafted in Turkey, with a mixture of copper and tin. The thick copper has been lined with tin, which is a stellar combination. The copper-tin combo makes for extremely efficient heat transference so you can cook faster and more efficiently. And never fear, the tin is completely lead-free, so there’s no risk of having lead seep into your food. The handle, helper handle and the lid handle are all made from brass. The color combination of copper and brass is super stylish and luxe. What makes this even more stylish is the hammered finish of the copper. It’s got some French country charm to it but would look amazing in any modern kitchen too. We think this is the perfect saucepan for a combination of style, design flair and high-quality materials. It looks as great as it cooks, and will last you a very long time. It can be used in the oven at reasonably low temperatures, but it’s really best as a stove saucepan. This is a fantastic gift for a cooking lover who is always looking for a new addition to their cookware arsenal. The copper pots we have chosen for you to browse provide a combination of safe, healthy materials, sturdy construction, attractive aesthetic and versatile usage. When choosing a copper cookware item, ensure it is specified as non-toxic to ensure a safe and healthy cooking process. NextWhat is Hard Anodized Cookware?